Introducing the revolution in bike training with the Cycleops Phantom 3 Indoor Cycle. There are many Bikes in the marketplace but none provide the smooth feel of the Cycleops Phantom 3 Indoor Cycle. Rated highly by many users and Fitness experts gives this Bike the number one spot on our list for home and institutional use. 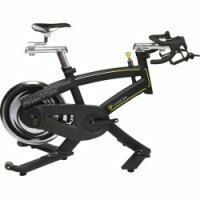 With its high quality and smooth feeling, its no wonder why many customers are buying the Cycleops Phantom 3 Indoor Cycle over other top name Brands. Cycleops Phantom 3 Indoor Cycle is becoming a leading indoor cycle in the fitness industry. Never miss a workout with the CycleOps Phantom 3 Indoor Cycle. Four points of adjustment easily duplicate the fit of your outdoor bike for maximum ergonomics, comfort and efficiency, seamlessly transferring your hard work to the outdoors.The super-stable 100%-steel construction and leveling feet on the Bike allows you to sprint and climb with wild abandon, and a freewheeling hub lets you coast and recover. When your purchase this Bike you will have the ease of mind that assembly will be a pieace of cake. The unit already comes roughly 85% Pre-Assembled. As well as coming nearly fully assembled, a hardware package is included to help with the remaining assembly required. This video will demonstrate how easy it is to set up your Cycleops Phantom 3 Indoor Cycle. The Cycleops Phantom 3 Indoor Cycle is easy to maintain and clean. This video will demonstrate that to you. With the Cycleops Phantom 3 Indoor Cycle you Get all the performance benefits of both Joule™ and our Pro Series frame. Joule includes dashboard, reports and history of your basic cycling functions. The Pro Series frame offers freewheel gearing and allows you to quickly adjust all geometries necessary for creating the perfect fit. With adjustment points for all the key heights and lengths, it's easy to dial–in your CycleOps Phantom 3 Indoor Cycle for the perfect fit. If you share the bike with others, simply jot down your coordinates and it'll never take you more than a minute to get it back in position for your next ride. You'll also find that years of research and testing have helped us deliver ride quality that rivals that of your outside bike. So grab a water bottle, hop on and prepare to watch time fly faster than you ever thought possible riding indoors. Whether logging miles while your favorite DVD plays or gazing out the window during a recovery spin, Joule™ 2.0 wirelessly collects and stores your data so you can focus on the ride.